I love when my foodie friends share their finds on Social Media, because every now and then I miss something wonderful that is right under my nose. One of the many things I love about living in College Park is that I have coffee alternatives other than the standard chains. However, I had no idea that just a few blocks from my house was a brand new option, this one being served by a fascinating lady in her very own coffee truck. Thanks to my friend Monica (@OrlandoEats on Instagram) I am now in the know and very much in coffee heaven. Jen Hackney owns and operates the adorable blue coffee truck that you may have noticed residing on Par Street right before the I-4 eastbound ramp. Originally from my home state of Connecticut, Jen's family moved to Florida back 1971, so although she's from the northeast, she feels like a Orlandoan at heart, even having attended Boone High school. Her coffee roots run deep as her resume includes working for Barnie's in the 80's, and then off and on with Starbucks for 15 years. She also worked for Melitta, a german coffee roaster. It's safe to say she knows her way around a coffee bean, and the drinks she cranks out of her adorable truck are proof of that. Her dream had always been to open up her own coffee shop, but as it happens so often with ambitious entrepreneurs, dreams can be interrupted by the reality of life. That did not deter her dreams permanently as she set off in search for the perfect truck to deliver her caffeinated capsules of deliciousness. After much searching she ended up finding her easily spotted blue truck on Craigslist and traveled with a friend to the rural nothingness that is Odessa Florida to check it out. The truck has a fun history as it at one time was owned by the Maitland Police Department as a Special Command Vehicle. Purchasing that truck set her off in the direction of her dreams. Once her truck was newly outfitted to provide coffee to the people of Orlando she tried setting up in different areas of town at office parks and call centers, but was not seeing the business that she needed. Not one to sit idly by, she took matters into her own hands and presented the option of setting up her truck in the parking lot of a local business. As of August 1st her truck lives in the lot of Daisy's Flowers on Par Street and so far she's enjoyed a great relationship with the owners, who opened their doors in 2000. Her iced chai tea latte is amazing as is her iced coffee which I get with coconut milk. In the case you are not a coffee drinker she does offer tea as well as smoothies from fruit she gets from the local markets every Sunday. Along with a variety of beverages she also offers an assortment of pastries that are great to grab with your morning coffee on the way to work. "Coffee brings people together," Jen said as we chatted. "I love meeting new people and learning their stories and I'm passionate about being kind and gracious to everyone. Customer service is very important to me." Also very important to Jen are her dogs and her general love of animals. She's looking to give back to local animal rescues in Orlando and she practices what she preaches living her life as a vegetarian. When I asked her what she loves most about our shared "hometown" of College Park she said "The geography of it. It's centrally located to everything, but I also love the quaint urban feel it has." We both agreed we look forward to seeing the 32804 zip code continue to grow and welcome new businesses that add to it's charm, much like her truck. 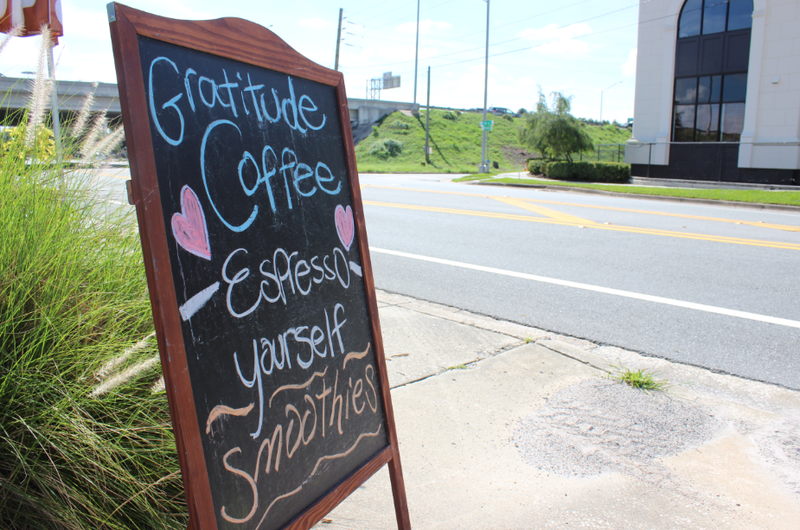 The name "Gratitude Coffee" comes from her attitude about life, simply being grateful for learning hard lessons in life, and coming out the other side. We can all certainly identify with that on some level, and her logo is a nice reminder of that, along with the paw print that dots the eye in gratitude. You definitely get more than just a cup of coffee when you visit Jen, she's always bright-eyed and happy to see her customers and she certainly starts your day off with a positive boost, not to mention some delicious coffee. Visit her Monday through Friday from from 7AM til 3:00PM and she is starting to test out Saturday mornings around 8AM. Follow her on Instagram to get updates about her whereabouts @gratitudecoffee.